Contaminated sediment poses difficult assessment and remediation challenges but recent improvements in methodologies offer much promise. New assessment methods and improved remediation technologies that directly address contaminant mobility and bioavailability have enhanced our ability to effectively manage sediments. Advantages include reduced cost and improved effectiveness over conventional methods. In this two-day class, we will address both conventional and emerging technologies for remediating contaminated sediments including removal followed by treatment and disposal; in situ isolation of the sediments from the environment by covering the sediment with neutral materials (i.e., passive capping); active capping technologies, and monitored natural recovery, which involves monitoring processes that isolate, degrade, transform, and immobilize sediment contaminants under natural conditions. The course will address solutions to contaminants in both marine and freshwater sediments including the effects of remediation on the benthic environment. Emerging technologies that address contaminant toxicity, biogeochemistry and transport mechanisms will also be highlighted. The class will incorporate new approaches for including bioavailability in risk assessments and the evaluation of remedial effectiveness. 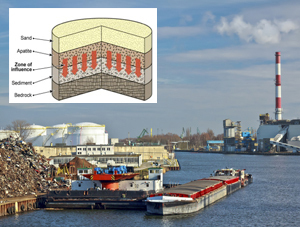 Bioavailability controls the transfer of contaminants from sediments to ecological receptors and humans and can rarely be predicted from total contaminant concentrations alone. Successful evaluation of bioavailability involves the selection of analytical methods that are suitable for the organisms and sediment environments under consideration and often involves a weight-of-evidence that incorporates multiple lines of evidence. Although problems remain, contaminated sediment management/remediation is improving due to the control and elimination of contaminant sources, development of new remedial technologies, and selection of analytical methods to evaluate metal bioavailability.